Awards & Recognitions | Power Rogers & Smith, L.L.P. Power, Rogers & Smith, L.L.P. has been ranked a National Tier 1 law firm by Best Law Firms in the area of mass tort litigation and class actions for plaintiffs. The firm has also been ranked a Tier 1 Chicago law firm in the areas of mass tort litigation and class actions, personal injury litigation, and product liability litigation for plaintiffs. Attorney Joseph A. Power Jr. is the president of the Inner Circle of Advocates, a group of the 100 most elite trial lawyers in the nation, and attorneys Todd A. Smith and Larry R. Rogers Jr. are also members of the organization. There are only five Inner Circle of Advocates members in the state of Illinois, and our firm employs three of them. Our firm is proud to have three attorneys who have been voted Best Lawyers in America® - Joseph A. Power, Jr., Larry R. Rogers, Sr., and Todd A. Smith. Attorney Joseph Power Jr. has been listed since 1987 and was also named “Lawyer of the Year” for plaintiff personal injury in 2010 and 2013. Attorney Larry Rogers has been listed in Best Lawyers since 1999 and was also named "Lawyer of the Year" in Personal Injury Litigation in 2016 and 2019. Attorney Todd A. Smith has been listed since 1995 and was also named “Lawyer of the Year” in Product Liability Litigation in 2019, medical malpractice law in 2012 and mass tort litigation in 2011. Membership in the American College of Trial Lawyers is by invitation only. Membership is excluded to 1% of the entire lawyer population in the U.S. To be considered for inclusion, a lawyer must exhibit high ethical and moral standards and exceptional character. Attorneys must also have been actively practicing primarily trial law for 15 years or more. Joseph Power is a fellow, Larry Rogers Sr. is a fellow, and Todd A. Smith is a member. Attorney Joseph A. Power Jr, Larry Rogers Sr. and Attorney Todd A. Smith are members of the International Academy of Trial Lawyers. The International Academy of Trial Lawyers is an elite group of the best trial lawyers, both criminal and civil, in the world. There are only 500 active members in the U.S. that have been accepted. All 14 of the attorneys at Power, Rogers & Smith, L.L.P. have been recognized as Illinois Super Lawyers®. Attorneys listed in Super Lawyers® represent the top 5% of attorneys in the state while those listed in Rising Stars represent the top 2.5% in the state under the age of 40 or who have been practicing law ten years or less. LawDragon recognizes the top attorneys in the nation based on a process of law firm nominations, votes and comments from legal professionals and editorial research. In 2011, LawDragon selected Joseph Power as One of the Best Lawyers in the Country. In 2009, LawDragon selected Larry Rogers Sr. as One of the Top Trial Lawyers. In 2016, Mr. Power, Jr. has been inducted into the Lawdragon 500 Hall Of Fame. We are proud of the fact that eight of our lawyers have been distinguished in Leading Lawyers Magazine. Joseph A. Power Jr., Larry R. Rogers, and Todd A. Smith were listed as top lawyers in aviation law, personal injury law, professional malpractice, and transportation injury law. Joseph W. Balesteri was listed as a top lawyer in personal injury law and professional malpractice law. Thomas M. Power was listed as a top lawyer for personal injury. Devon C. Bruce was listed as a top lawyer in personal injury and professional malpractice law. Thomas G. Siracusa was listed as a top lawyer in personal injury law and professional malpractice law. Larry R. Rogers Jr. was listed as a top lawyer in personal injury law. Power Rogers & Smith has earned the top spot in the Chicago Lawyer Settlements Report for an unprecedented nine years in a row. This list includes the highest-earning firms in the entire state of Illinois, breaking down every single reported settlement in order to determine which firm secured the most for their clients. In the 2018 report, approximately $1.5 billion was recovered by law firms throughout the state – Power Rogers & Smith accounted for a staggering $205 million of that total. Power, Rogers & Smith, L.L.P. Attorneys Joseph A. 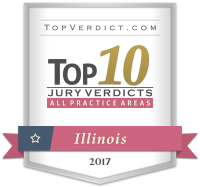 Power Jr. and James Power secured an $85.9 million jury verdict which has been recognized among the Top 10 Verdicts and the fourth-largest plaintiff and cross-claimant verdict in the state of Illinois in 2017 by TopVerdict™. The recovery was made on behalf of our client, a truck driver who suffered catastrophic leg injuries requiring a double amputation in a crane accident. The jury initially awarded our client and his wife a total of $95.4 million in compensation, which was later reduced for the plaintiff’s liability. The attorneys at Power, Rogers & Smith, L.L.P. have been recognized for excellence in their fields. To put their expertise in your corner, call today!